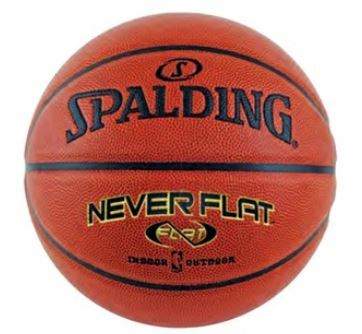 Spalding NeverFlat Basketball 74096E Composite Size - 29.5 Inches (regulation size) Circumference. 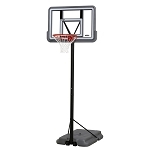 Spalding Basketball Official NBA Size and Weight Designed for Indoor and Outdoor Play. 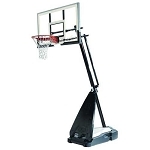 No more scrambling to find the pump and needle to inflate the ball each time you want to play. 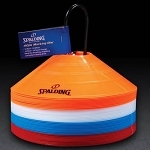 NeverFlat technology keeps the ball inflated up to 10 times longer than traditional basketball designs. Guaranteed to retain air for 1 year. NitroFlate injected molecules form a protective barrier against air seepage. Ships via: FedEx or UPS. Doorstep delivery. No signature required for most residential addresses. Lead Time: Generally ships out the following business day after order is placed. Shipping can take between 3 to 10 days depending on your location. Item ships from Alexander City, Alabama. Damaged shipments are extremely rare. Should anything be damaged upon arrival please note that with the driver or refuse shipment. We'll send out a replacement at no cost to you and we'll file the freight claim making it a painless process for you. 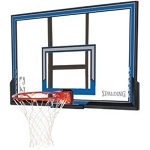 A: All Spalding basketballs get a one year manufacturers warranty from the date of purchase. The warranty covers any type of manufacturing defects.